CityFlatsHotel is the premier location for your next event. Our wonderful staff is here to help you celebrate your special occasion in style. Let us help you realize your vision in one of our unique spaces! We host a variety of personal and professional events and can accommodate most groups. Our modern, eco-friendly hotel is perfect for any gathering you have in mind. Both our Grand Rapids and Holland locations have lots to offer. Located in the heart of downtown Grand Rapids, MI, CityFlatsHotel Grand Rapids will put you in the middle of a wonderfully diverse community with plenty of entertainment. Our staff can assist you with planning anything from corporate events and workshops to birthday parties and reunions. Situated in picturesque Holland, MI, our Holland location is in the city named one of the happiest in the country. Close to world-class beaches and one of the nation’s tulip farms, CityFlatsHotel Holland provides a rooftop events space with fantastic views of downtown and Lake Macatawa. Host a happy hour or private dinner at our beautiful venue. Sleek, modern, and sophisticated—we offer several outstanding venue options for weddings, dinners, reunions, and other special occasions. If you are interested in the perfect ballroom or lounge space to host your event, CityFlatsHotel Grand Rapids has something for you. Our CitySēn Lounge provides that big city feel with a carefully planned cocktail menu, craft beers, an extensive wine list, and a patio area that opens up to Monroe Center. Rent the entire space for private parties like a rehearsal dinner or partially reserve it for other smaller events. For a more formal affair, our elegant ballroom and banquet spaces are a balance of historic architecture and modern flair. CityFlatsHotel Holland’s CityVū Events rooftop is the ideal space for a fundraiser, anniversary party, or retreat. Enjoy dinner, music, and cocktails under the stars or overlooking a bright, sunny day in town. The main floor lounge is also a great spot for reconnecting with old friends for a happy hour event. For birthday parties and reunions in a private indoor locale, enjoy exquisite catering in our contemporary main floor event space. 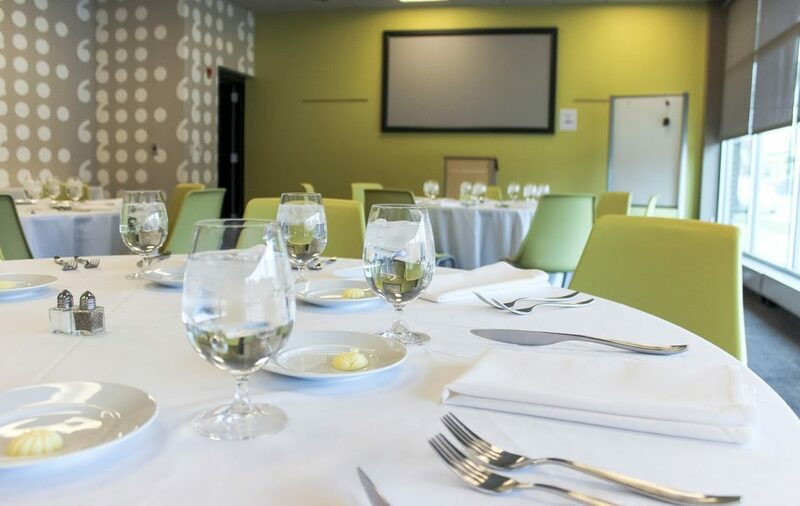 Our banquet spaces at CityFlatsHotel Grand Rapids are a beautiful backdrop for your wedding, meeting, or gathering. Host an intimate party or luxurious celebration with delicious on-site catering prepared by our executive chef. We are fully equipped with a state-of-the-art LED lighting system, surround speakers, and flat screen TVs to create the perfect ambiance. We provide the tools necessary for a successful corporate event or seminar setup as well. From projectors and TV monitors to high-speed Wi-Fi and A/V hookups, CityFlatsHotel Holland is the perfect location for meeting spaces and presentations. Wedding and special events parties can also indulge in floor-to-ceiling windows, delectable catering, and a stunning view of Lake Macatawa from any one of our lounges or main floor private rooms. For more information about our Grand Rapids location or to have the staff make a specific recommendation for the space best for your event, fill out our online form or send us an email. To learn more about our Holland location, fill out our online form or send us an email.